While Minnesota’s food system requires myriad changes to ensure healthy, safe, and affordable food is accessible for everyone—Minnesotans of color and American Indians are disproportionately affected by these issues. Cultural barriers, such as institutional and economic inequities, human rights issues, and access to influence and decision-making power, prevent these communities from reliable access to healthy and affordable food. Income & Transportation: Many low-income people have limited access to affordable transportation and face lengthy travel times to reach sources of affordable, healthy food. Income & Housing: Many food processing jobs in rural Minnesota are seasonal, temporary, and low-paying. Adequate, affordable housing for these workers is often unavailable and can lack space and equipment to store and prepare healthy food. Income & Language: New immigrant farmers, who grow a lot of Minnesota’s healthy, fresh food, lack reliable access to affordable farmland, seeds, equipment, and insurance. Language also presents a barrier, as many resources and organizations that serve farmers are only available in English. Illness: Many people who hunt and gather food—from deer to fish to wild rice to berries—suffer from long-term, devastating health effects caused by tick-borne diseases, on a dramatic rise in Minnesota. These illnesses can prevent people from getting and consuming these healthy foods, therefore increasing use of low-cost, unhealthy options. The Minnesota Food Charter contains policy and system change strategies that are proven to be effective in advancing health equity from farm to table. These strategies can be implemented at all scales—from an individual organization or community to federal policy. To help decision-makers and practitioners wishing to improve access to healthy food for their communities, the Minnesota Food Charter Network has published the Health Equity Guide: a companion resource to the Food Charter that offers tools, information, stories, and strategies to help level the playing field for all Minnesotans. If you work with community members on food or health issues, the Health Equity Guide offers important information to improve access to healthy food and reduce diet-related chronic disease for communities most affected by these issues. 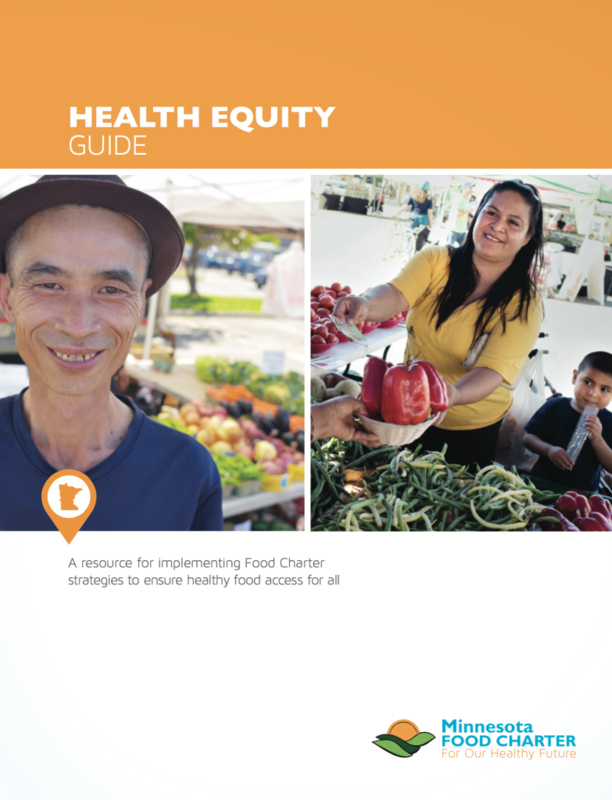 If you are part of a local or state institution or agency working on healthy food related policy and systems changes, the Health Equity Guide provides useful resources to effectively undertake health equity-oriented work in partnership with the communities you serve. Food is a great way to improve health equity. Get your copy of the Minnesota Food Charter Health Equity Guide here.